"If tradition isn't working, why keep doing it?" says Michael Rezi. At Nissan of Cookeville, he intentionally hires people with no experience in car sales, and employees' training never really ends, as the store conducts classes every week. Break with tradition: Michael Rezi, a young Italian immigrant, was unimpressed by unsuccessful "traditional" practices in auto retailing. Now with his own store, Rezi has crafted his own strategies for vehicle pricing, employee training, compensation practices and advertising. Nissan of Cookeville went from selling 60 to 65 new and used vehicles a month to more than 200. COOKEVILLE, Tenn. -- Michael Rezi will proudly tell you that they do things differently at his Nissan of Cookeville store, here in this central Tennessee market of 100,000 people. But that is specifically the way the 32-year-old dealer wants it. Rezi has crafted his own approach to vehicle pricing, a different method of training employees, different compensation practices and a gutsy advertising strategy that canceled almost all traditional media spending to focus almost exclusively on digital and social media. "I worked at other dealerships, with other people in the car business," says the dealer in the clear Italian accent he brought from his hometown of Florence. "It didn't seem to be working well, the way everyone was doing things in all the usual ways. "I decided that if I ever got my own dealership, I was going to do everything different from the normal practices. If tradition isn't working, why keep doing it?" The chance to freely put his ideas into action came in 2011, after he had turned around a struggling Nissan store as a general manager in Gallatin, Tenn., just north of Nashville, and was invited to come into the Cookeville store as an owner. "Our goal really is to earn the loyalty of our customers. That's how I want to make a name for the store in this market." The store had been languishing in the shadow of nearby Toyota and Honda dealerships. It was selling 60 to 65 new and used vehicles a month; it was losing money; and its customer satisfaction scores were terrible, Rezi says frankly. Today, four years later, the store is selling more than 200 new and used a month. Rezi says he's outselling both Honda and Toyota in Cookeville. He has been the top retailer of Nissan Frontier pickups in Tennessee, and his store ranks in the top 10 percent of pre-owned sales volume in the Southeast for Nissan. The store's customer satisfaction scores are running far ahead of his Middle Tennessee Nissan sales region and are in the top 5 percent in the nation. On measurements of conquest sales, customer loyalty and repeat business, the store is outperforming the region and the nation. "When I was still a salesman a few years ago, a guy I worked with told me I was spending too much time on each sale," Rezi recalls of his not-too-long-ago apprenticeship. "He told me I'd never last in the car business. "I guess I'm proving him wrong." Rezi is surrounded by other young people at the store, most of them in their 20s. He intentionally hires people who have no experience in the field, on the premise that they are not bringing traditional auto sales practices and attitudes with them. But to compensate, he devotes more time to training them. Each new employee spends a week driving the cars in Nissan's portfolio and getting to know them all. The hire spends another week doing in-depth walkarounds of each vehicle, learning the trim packages and understanding the technologies it contains. The new hire then spends two weeks working as a sales support apprentice, shadowing a more experienced salesperson, observing and helping on interactions and sales. The training then continues indefinitely, as it does for everyone on the 80-person staff. Every Wednesday and Friday, the store conducts classes to dive deeper into various topics and skills. Subjects include the art of selling, effective phone methods and negotiation practices. The employees receive a guaranteed salary of $30,000 a year. Additional commissions and bonuses are tied to things other than moving metal -- such as shoutouts on the online review site Yelp. Community involvement can earn employees a bonus. Helping out a service customer can earn them a reward. So can helping another salesperson with a sale, or assisting a customer in a department other than their own. New bonus targets are introduced from month to month to give employees something new to shoot for. Boosted by the stream of bonuses and customer satisfaction targets, the median income for the staff is $6,850 a month, according to Rezi. More than a fourth of the employees earn $70,000 a year. He also allows for flexible work schedules and provides everyone a free gym membership in Cookeville. "We're looking for goodwill here in our community," he says. "My goal isn't just to sell cars -- I want to do that, of course, but that's not how you build a business long term. "Our goal really is to earn the loyalty of our customers. That's how I want to make a name for the store in this market. And we're doing it by spending more time with the customer and making sure we fully show them why our product is a good purchase. Future sales will come from that." A customer who wants to negotiate down the asking price likely will have an experience Rezi calls "collaborative pricing." The Nissan salesperson will sit with the customer and open a laptop. The two will explore together all competitive products, vehicles in inventory at other brand stores and also the same model being offered by other Nissan dealers in the region. The process will delve into the trim packages available and discuss the different features that are included in the specific vehicle being negotiated. When the research is completed, Rezi's sales associate will ask the customer: "Do you think we're offering a fair price?" If the answer is still "No," the associate will ask: "What do you think would be a fair price?" If the customer's counterproposal is reasonable, the associate will accept the offer. If the customer shows the salesperson that Rezi's asking price is too high, based on their competitive search, the associate will say, "You're right. We're not competitive," and then meet the competition's lower price, if it's reasonable. If after all that, the customer is still prepared to walk away, the Rezi associate is trained to let him or her leave with a positive feeling toward the store, confident that the dealership has communicated an effort to be transparent, honest and fair. "I know that might sound a little unusual to some people," Rezi says, "But we're very serious about it. I want our customers to understand our prices and the value of the car they're buying. I want them to be comfortable with it and realize that it's a good price." Establishing a more relaxed workplace and offering a more transparent sales process are goals many auto dealers are considering as younger millennial consumers enter the car market and the working world. 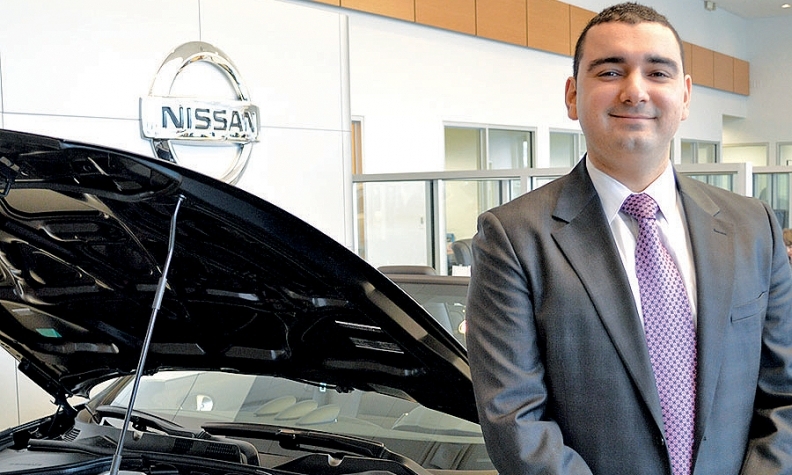 Like many young dealership employees, Rezi entered auto sales unexpectedly as a 20-something. He had come to the United States to study accounting at Kennesaw State University near Atlanta. But after graduating and getting a job in the United States as an accountant, he realized it wasn't what he wanted. "I hated being at a desk all day," he says. "I wanted to be up and interacting with other people." He tried his hand at selling cars part time, and the experience grabbed him. But shortly after he changed careers in early 2008, the auto market crashed. Rather than being deflected by shrinking industry sales, he hustled. "I realized I might be lucky to sell a car all day," he remembers of 2008 and 2009. "So if a customer seemed at all interested, I'd do anything to get him into a car. I'd drive it over to his house at night. I'd let him keep it for a day to see if he liked it. "The other salesmen thought I was crazy," he says. "But I had a lot of success. I believe you have to try new approaches to get new results."